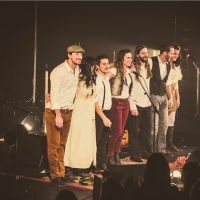 Bears of Legend is a band of 7 musicians and singers with a folk rock progressive sound out of the ordinary. The very energic band Bears of Legend are coming back with their second album Ghostwritten Chronicles. With their sound and captivating harmonious voices do not miss Bear of Legend on the stage of the Vieux Terrebonne Theater in December 2016.